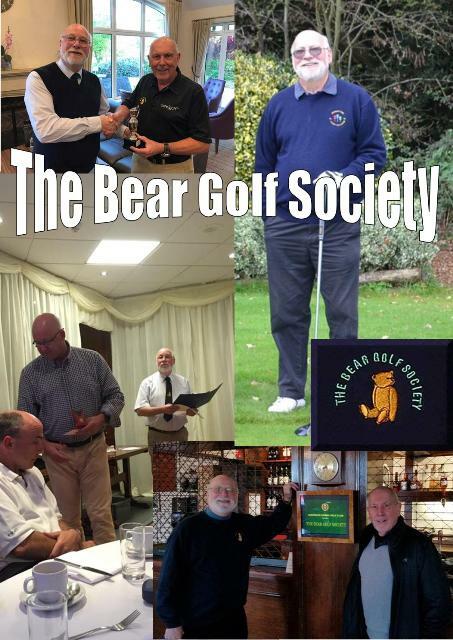 Founded in 2001, the Bear Golf Society is now in it's nineteenth season. We pride ourselves in maintaining an annual membership in excess of fifty. Our intention is to have fun and enjoy the golf, with any surplus funds being donated to numerous charities. We start our 2019 season at Stocks Golf & Country Club in March, playing monthly throughout the year, finishing in October. In addition we have an End of Season Bash late November. A good fun day with a festive flavour. Scores are recorded on our computerised HandicapMaster system which means you always have a current handicap with The Bears. Visitors are always welcome - either with a member or if you just want to give us a try - call the organiser Ben on 07831116392 - you will be very welcome and assured of a great day out. Copyright 2011/12/13/14/15/16/17/18/19. Clip Design/Grumpy Designs 2015. All Rights Reserved.